Coming off an incredible 42-41 overtime win at home against the Cal Poly Mustangs, Beau Baldwin and the No. 8-ranked Eastern Washington Eagles will aim to keep the momentum rolling under the dome in Pocatello, Idaho. The Idaho State Bengals won last week as well, pulling off a 37-31 victory over the University of North Dakota to snap a painful four-game losing streak. Now 3-2 on the season with a 2-0 Big Sky Conference record, the Eagles look to continue on their way to what would be a fourth consecutive Big Sky Conference championship. The Idaho State Bengals are 2-4 in 2015, with a record of 1-2 in Big Sky Conference match-ups. These two teams have had very different seasons thus far, with Eastern's marked by narrow victories and Idaho State's highlighted by a slew of huge losses. In EWU's three victories, they have won by a total of only 14 points. On the other side of the coin, ISU suffered their four losses by an unbelievable margin of 176 points, aided by losses of 52-0 and 80-8 against FBS opponents Boise State University and University of Nevada Las Vegas, respectively. Eagles receiver Kendrick Bourne stepped up last Saturday, hauling in 10 catches for 84 yards and two touchdowns. Bourne's play was essential in the overtime victory, as his second score gave EWU the lead on the first play of the bonus period. Overlooked due to Cooper Kupp's incredible season, Bourne is having a strong year of his own, compiling 7 touchdowns (4th in FCS) and 514 yards (11th in FCS). Another Eastern player to keep an eye on this week is quarterback Jordan West, the leader of the top-ranked aerial attack in the FCS (417.8 yards per game). Despite winds that reached 33 mph in Cheney last Saturday, West still managed a respectable 224 yards and 4 touchdowns on 27-35 passing. West should be closer to his average this weekend in the domed environment of Holt Arena. The Bengals have some offensive playmakers of their own, including red-shirt junior running back Jakori Ford, who has made the most of his limited carries in 2015. Ford has managed a healthy 5.6 yards per carry and 9.3 yards per reception thus far for Mike Kramer's football team, proving to be a valuable backup to senior running back Xavier Finney. In the season opener against Black Hills State, Ford opened it up for 201 rushing yards on 24 carries. Facing the worst rushing defense in the FCS (351.0 yards per game), Ford will look to exploit any holes that the Eagles' defense offers. Bengals' receiver Madison Mangum has been putting together a fine season, racking up 39 receptions, 543 yards and six touchdowns through six games. Mangum is coming off his best performance of 2015, in which he hauled in 10 receptions for 142 yards and a touchdown against UND. The run game isn't the only place where the Eagles defense has struggled, allowing 557.4 total yards per game to opposing offenses, ranking dead last in the FCS in total defense. Mangum and Idaho State quarterback Michael Sanders have a good chance to put up some numbers on Saturday for the home crowd. 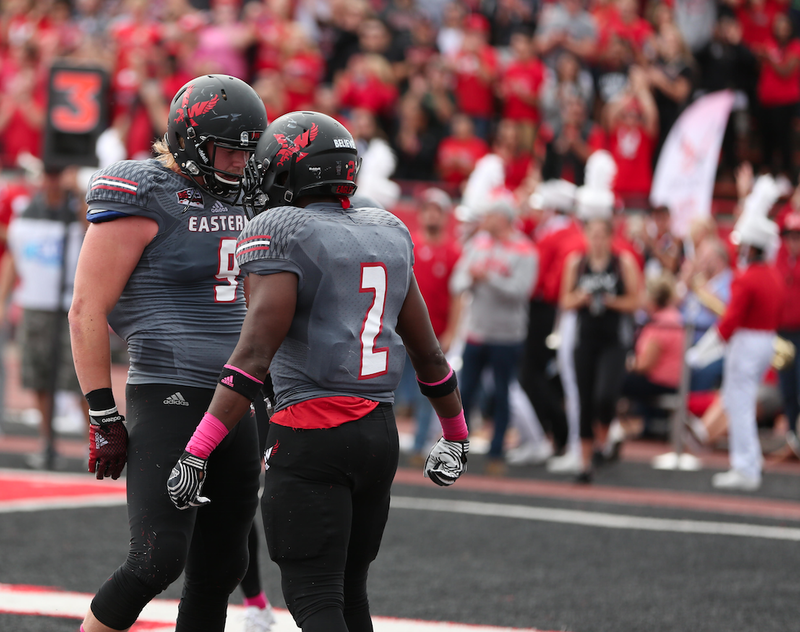 Saturday's game should be plenty entertaining, as Jordan West and EWU's passing attack take on Idaho State's third-ranked passing defense (130.8 yards per game). The Bengals can put up some offense as well, with the 37-ranked overall offense in the FCS (416.0 yards per game). Needless to say, this Big Sky Conference clash is poised to be an offensive spectacle. The game kicks off Saturday at 1:35 pm PST at ISU. There will be no television coverage, but fans can watch the game at watchbigsky.com or listen in on 700 AM ESPN or at www.700espn.com. Check in with EWU Football social media accounts on Friday for more information on where to view the contest.